Hi, Friends of St Brigid Press! 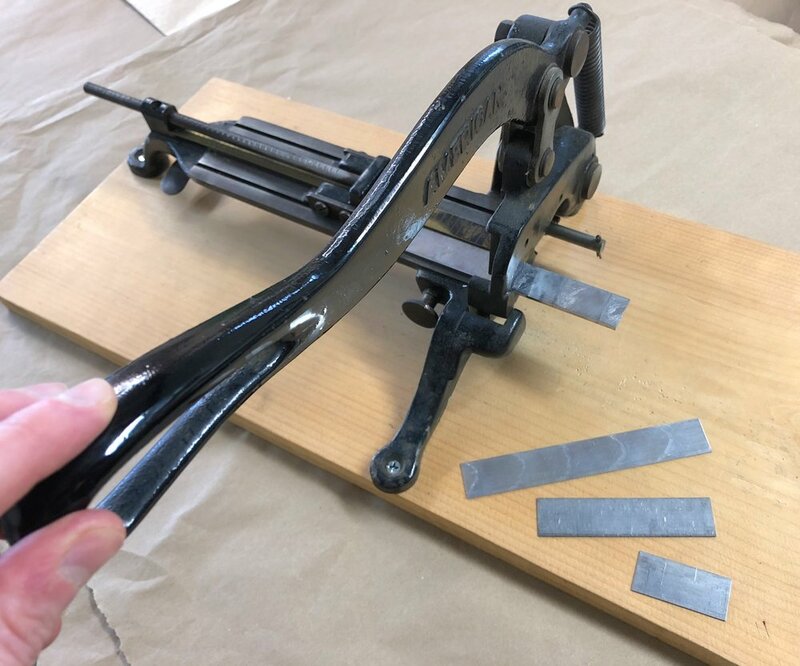 Here is the long-awaited fourth installment in our occasional blog series ~ A Letterpress Lexicon ~ about the words and phrases that identify printing's particular tools and processes. Enjoy! You might already know that every single letter of the alphabet that we set and print here is a physical piece of metal or wood ~ a piece .918-inches tall, with the reverse image of the letter on the top, in relief. Moveable type, which makes everything possible here at the Press. Here, the letters of the word "haiku" in metal. Well, every single SPACE between every word and every line is also a physical piece of metal or wood. These pieces are made a little lower than the top of the letters, so that they do not pick up ink. In this photo, you can see all of the metal spacing material surrounding the metal letters. The spacing material is a bit lower in height, so it does not get ink on it, and comes in various sizes according to the size of the type (12-point, 24-point, etc.). The spacing between the lines of type is also metal, cut to length. The spacing material is cast to a point-size matching the size of the type body being set ~ from tiny 6-point to giant (and heavy!) 72-point in our shop. Spacing is also cast in various standard widths, so the typesetter can put larger or smaller spaces between words, as desired. These widths range from multiples of an "em" (the square of the type body; for example, a 12-point-by-12-point square) to "thins" (brass and copper slivers to fill in the smallest gaps in a line). 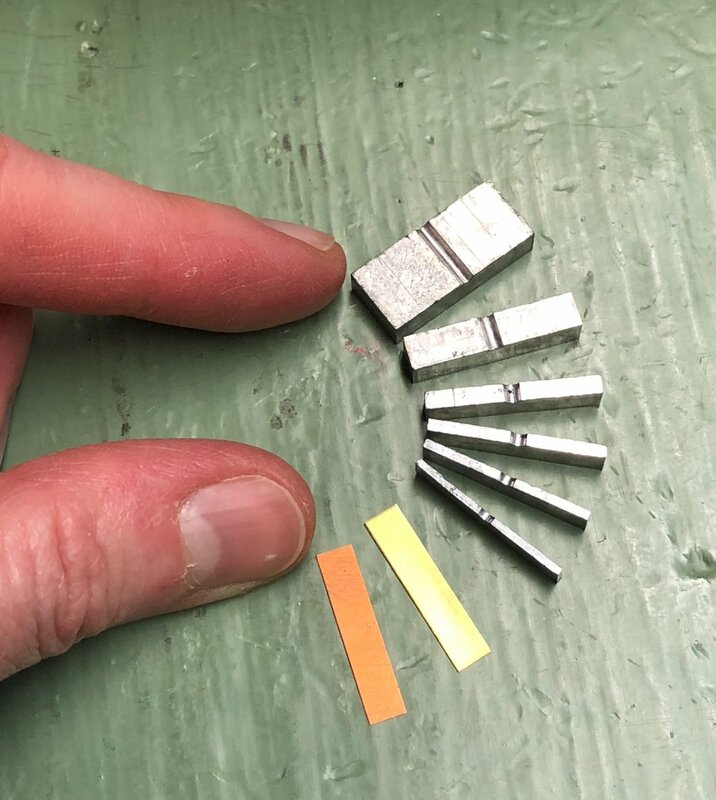 Spacing material, in various standard point sizes and widths. "A place for everything & everything in its place." Or space. 12-point size spacing material, from the widest ("2-em") to the thinnest ("copper thin"). 48-point "Em" space ~ a big chunk of metal. The thinnest spaces, made of brass and copper, fill out the tiniest gaps in a line. In addition to letter spacing, strips of metal also need to be correctly sized and set between lines of type ("leading" or "linespacing"). This strip material comes in various widths and can be cut to various lengths (also called "slugs") ~ all tailored to ordering the printed page. 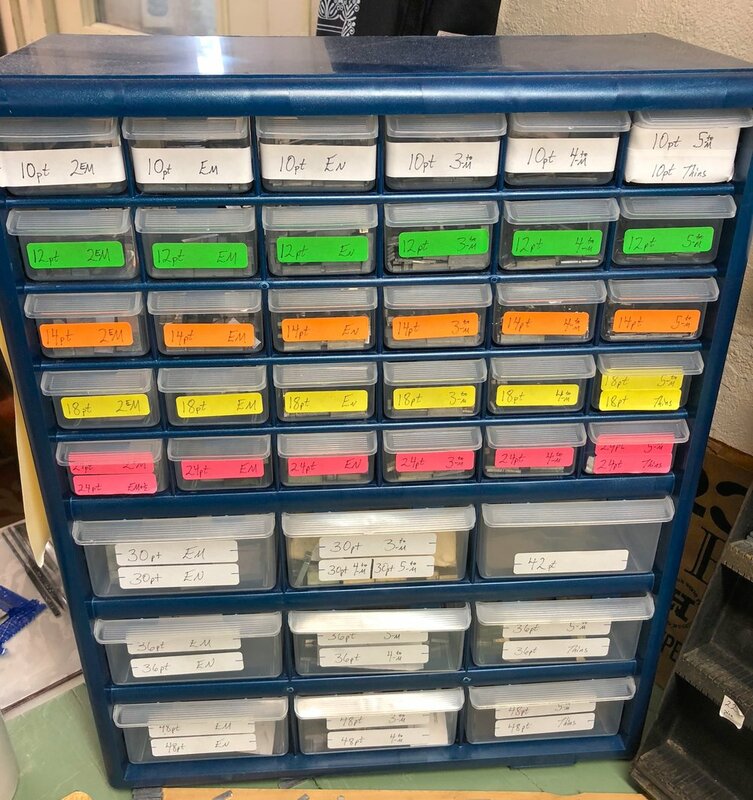 A rack of metal strips, or "slugs," in various lengths, to place between lines of type. A vintage "slug cutter," to cut metal strip material to the desired length. The whole point of spacing is to surround the letters and lines as snug as possible. A loose letter can print unevenly, and even become damaged. 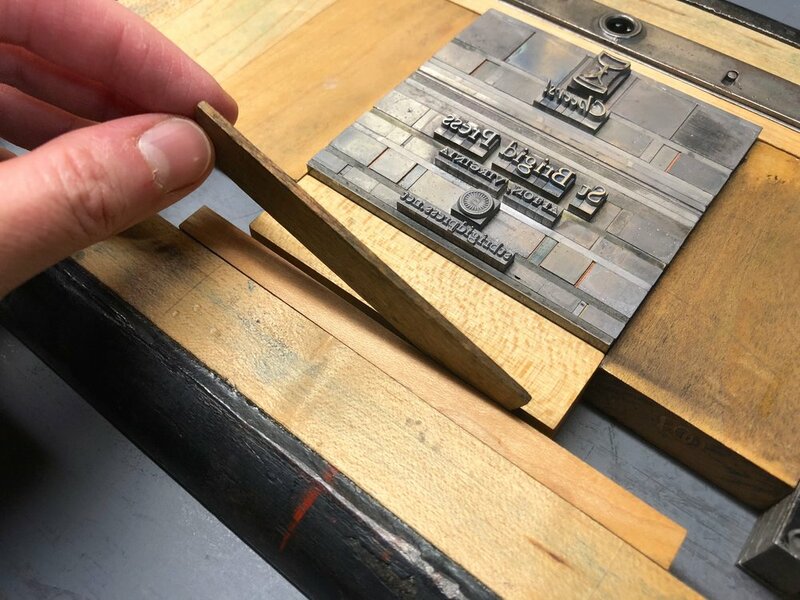 The final step before printing is to surround the whole forme (the letters and spaces) with "furniture" ~ blocks of wood (sometimes metal) in various standard sizes that fill out the chase. Two quoins (a kind of lock) are placed in as well, and when turned with a key the quoins tighten everything together. Wood "furniture" surrounds the metal forme, filling out the chase. 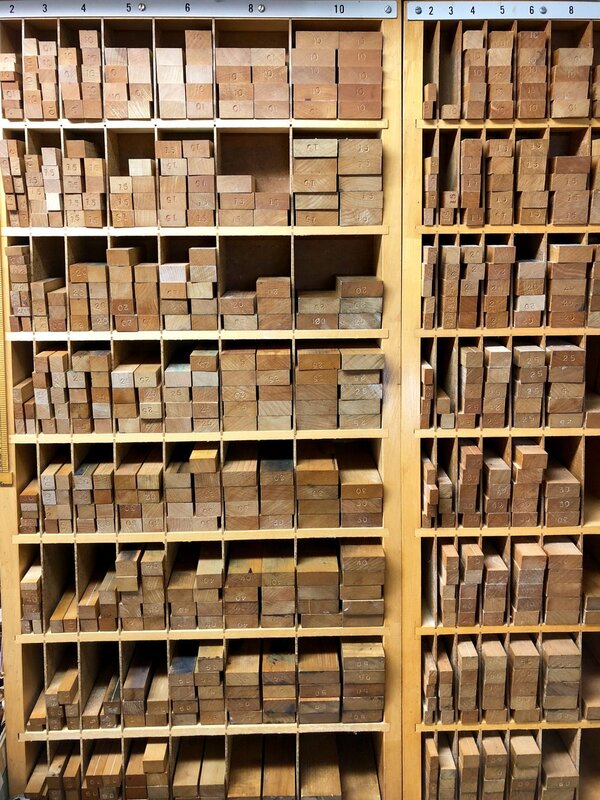 Racks of wood furniture at St Brigid Press, ordered according to length and width. Reglets are thin strips of wood furniture, to fill in the smaller gaps in a chase. Emily inserting a reglet, a thin strip of wood, to fill in the last gap. 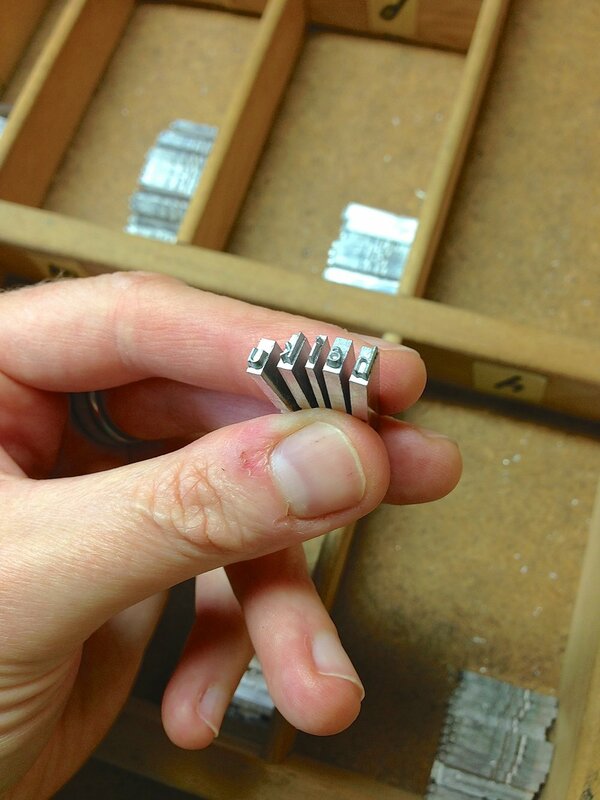 Turning the quoins, or locks, to tighten the whole forme in the chase. 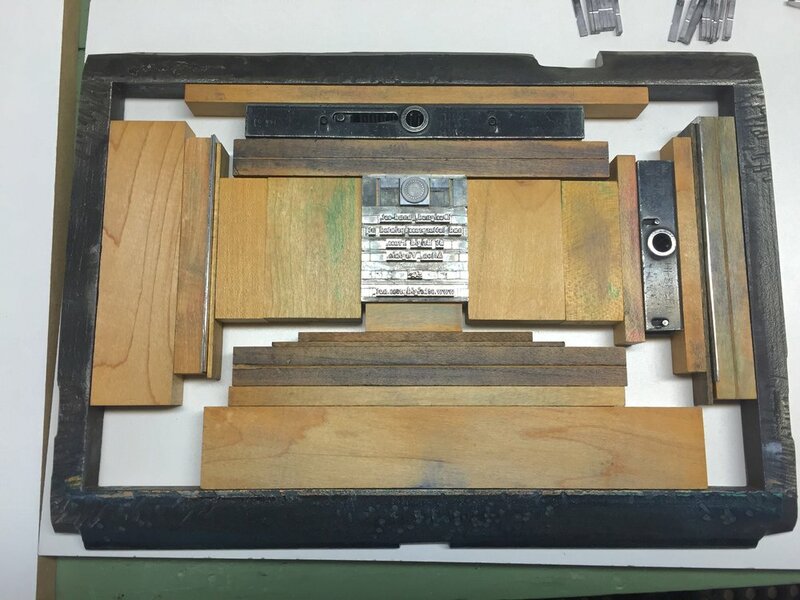 When the forme to be printed is locked up tight, I can lift it off the table and into the press without fear of everything collapsing onto the floor. Emily, holding a tightly locked forme in mid-air. If the spacing material has been set correctly, the whole thing can be transferred easily to the printing press. If it has NOT been set correctly... well.. catastrophe can ensue. Now, when you see a printed page, you'll think of the actual mass and work of all that "white space"! Shown here, a leaf from Jeff Schwaner's Wind Intervals. So, that's the story of SPACE at St Brigid Press!